~ Making a house a home. Again. 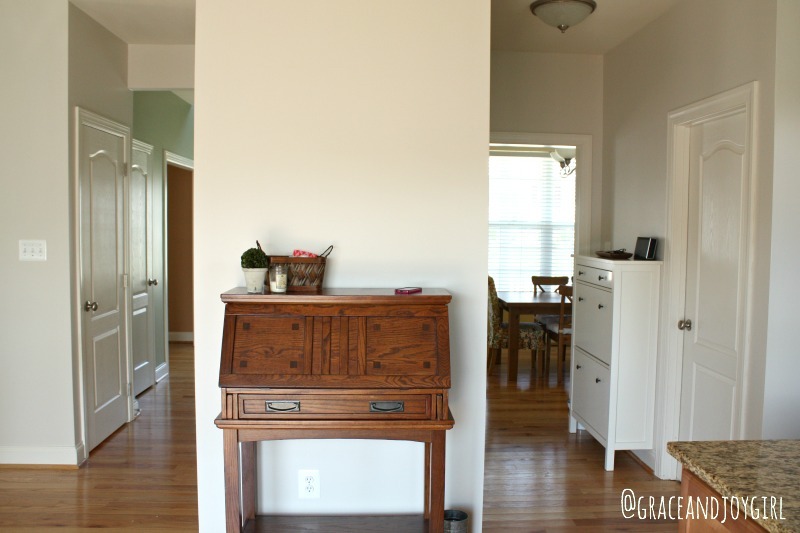 Last week I gave you a look at the dining and living/music room in our new house. If you need a refresher, you can check it out here. Lets keep on strolling through the foyer toward the back of the house. AKA, where we live. The kitchen and family room. A little, ok, a LOT, of Sherwin Williams Windfresh White has completely changed this space. The green just wasn’t the vibe I was going for and I can’t wait to rid the whole house of the minty, not-so-restful, color. So much better! The trim still looks fresh and white and it feels like I can breathe. The even bigger change for me is the white fireplace surround and mantle. I think it looks SO much better now (even though it was a giant pain in my patootie!). That yellow-orange, grainy wood just wasn’t my jam. And I’ve got a looooong way to go in here. The hubs needs to hide the wires by the TV and we need to get a smaller cabinet to house the media equipment under that window. I wish there was a way to do built-ins, but even a really low bench wouldn’t work. It would block the entrance to the the stairs that lead to the second floor. Honestly, the paint color is a little stark with nothing on the walls, no curtains, and against the dark red furniture (which looks best with a tan or beige color). But, all of those things are changing, too! I’m planning to move the white blinds upstairs to the girls room. I’m so glad the windows are the same sizes because the second floor currently has roller shades which aren’t very functional (or pretty). Also, the windows on the front of the house on the first floor (living/music & dining room) have these same blinds so it will give some continuity to the front of the house from the outside. I’m going to add bamboo shades in here to bring a little wood tone to this side of the room. I’m hoping that will mimic the maple cabinets that are in the kitchen. How’s that for showing you the good, bad, and ugly. This is the day we came to paint after we had closed, but before we had our stuff. So what you see is painting supplies, take-out trash, and a tub of cleaning supplies that we hauled north from New Orleans. Oh, and our “furniture.” An outdoor folding chair. Which was a gift considering that we had NOTHING to sit on the last time we moved and our furniture delivery was a week late. But back to the kitchen. The paint color is a HUGE improvement. I’m not a big fan of the cabinet color, countertop, or appliances. I really want a white kitchen (check out my kitchen Pinterest board for proof!). I was determined to paint the cabinets until it really sunk in that I had black appliances. Boo. So for now, I’m living with them. At this point we can only guarantee 2 years in this house. Who am I kidding?! We can’t guarantee anything. But, if we find out we’re staying longer there will be some BIG changes in here. I’m thinking Whirlpool Ice or GE Artistry appliances, a butcher block island, and soapstone surround. Oh, and white cabinets. The cabinets themselves are awesome. They’re good quality with deep, soft close drawers. The layout has been working out really well (even though I miss having an actual pantry) and the sink is a dream I didn’t know I had. It’s large and deep on one side with a smaller side for the garbage disposal. I learned that it’s an off-set, undermount, double, similar to this. Who knew that’s what I wanted? Certainly not me. And I really want you to see this view. This shows how you see back into the other spaces in the house. Which is again, why I need a more cohesive paint scheme. Standing in this spot at this very moment I can see Windfresh White, the minty green (foyer), a dark peach (living room), and two yellows (dining room). It’s too much for my tired eyes. So there it is. The first floor of our new house. Well, except the half bath and the laundry room. But, I may have stuffed all the excess stuff that I didn’t want in these pics into those two tiny rooms. So they’ll have to be in the spotlight another day. 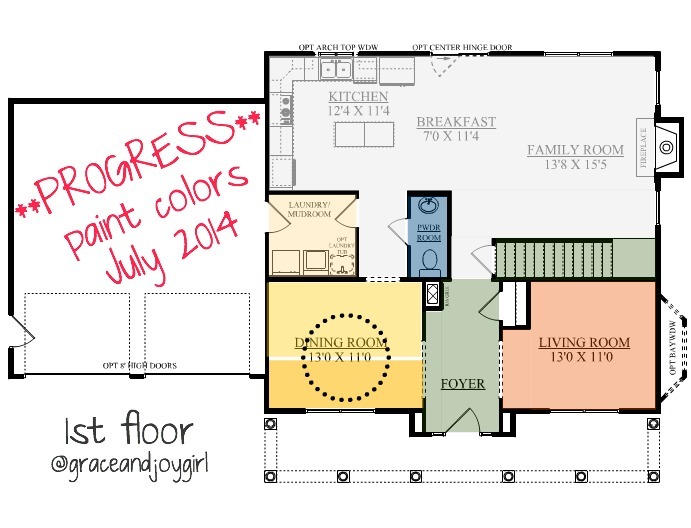 I love, love, love house tours on blogs. I’m working on adding a house tour tab, but for now it would only have 2 posts. Blah. But if you have a tour of your home on a blog, leave me a link in the comments. I’d love to come snoop around get some inspiration!